North Middlesex University Hospital, Sterling Way, Edmonton, London, N18 1QX. A 78-year-old woman presented to the vascular surgeons for a routine varicose vein procedure. She was fit and well with no significant medical history and had no cardiovascular risk factors. Clinically she was asymptomatic with a good excercise tolerance and no signs of heart failure. During the pre-operative assessment, a loud systolic murmur was heard all over the precordium with greatest intensity at the upper left sternal edge. Her electrocardiogram was unremarkable. 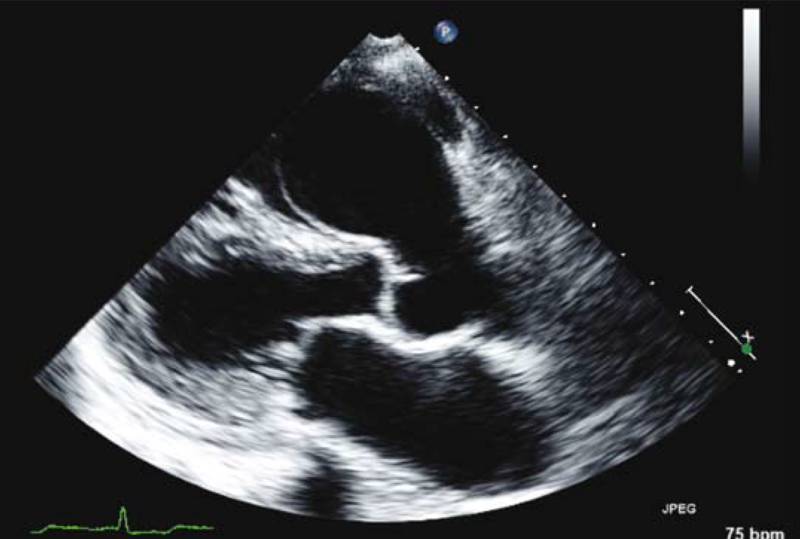 A subsequent two-dimensional echocardiogram revealed a dilated aortic root and a large, 6.6cm aneurysm of the right coronary sinus of valsalva (see figure 1), which extended into the right ventricular outflow tract causing obstruction with an associated gradient of 44 mmHg. Her right ventricle was hypertrophied and there was mild tricuspid regurgitation. Her left ventricular function was normal and there was evidence of mild aortic regurgitation. A cardiothoracic opinion was sought but the operative risks were deemed unacceptable to both the surgeon and patient. Aneurysms of the sinus of valsalva are rare and almost always originate from the right or non coronary sinuses. Unruptured, they normally remain clinically silent (detected by routine echocardiography) but can cause right ventricular outflow tract obstruction, aortic regurgitation and myocardial ischaemia from coronary artery compression. Rupture of these aneurysms can occur into any adjacent cardiac chamber and the clinical presentation may vary according to the location of this rupture. The definitive management is surgical repair, with pre-operative treatment of heart failure, endocarditis and arrhythmias where relevant. The exact nature of the surgical procedure depends on whether any associated structural abnormalities, such as a ventricular septal defect or aortic regurgitation require repair at the same time. Untreated aneurysms tend to progressively dilate and eventually rupture, with significant morbidity and mortality implications. The decision to repair or not is on a case by case basis, as this is such a rare condition and there are no formal guidelines.